When we come back next week from our weekend, we will start having full day sessions. We still have many bills that need to be debated on the floor and it is my hope that our body continues to work together for the greater good of all Nebraskans. If you observe the legislature, you know that I’m not a big fan of shenanigans when we have a long list of work that needs to be accomplished. I had a great visit this week with 4th graders from St. Bernadette School in Bellevue. We talked about what Senators do every day, the process we use to make laws and how it is important to remember that one person can and does make a difference should they choose to do so. This week I invited other Nebraska Senators to meet with Brigadier General (Ret) Paul Cohen, Colonel (Ret.) Jeff Mikesell from the Omaha Chamber of Commerce (pictured above) and Colonel (Ret.) 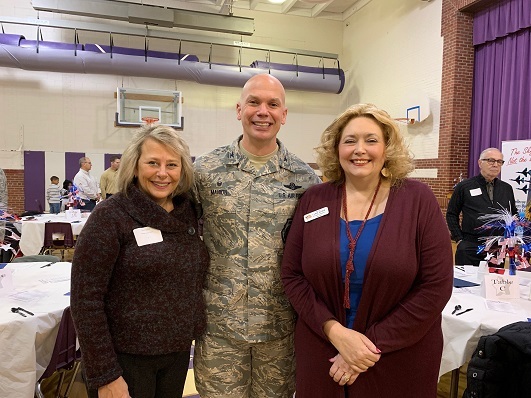 Dan Donovan from the Heartland Chapter of the Military Officer’s Association of America (MOAA) to discuss how we can continue to pool resources and work together as a body to make Nebraska the most welcoming state in the US to our Military Families and Veterans. There is always more to be done and we need to continue to move forward in this area. LB15 was on the agenda this week for debate in front of the full legislature, but time constraints didn’t allow us to get to it yet. I’m thankful that the speaker decided to make it one of his limited priority bills and am confident that we can get it passed next week. 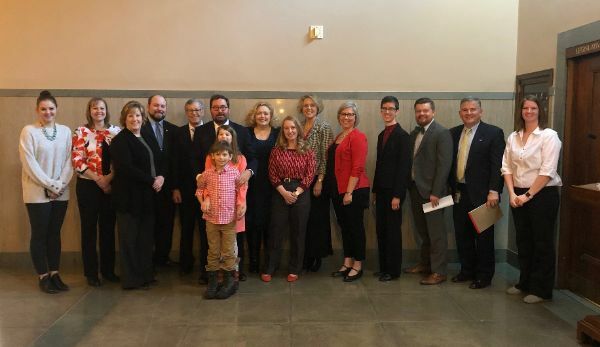 The children of Nebraska need to be able to get hearing aids if they need them and this bill will go a long way towards helping them do that. From the Nebraska Attorney General – While compassion and support are customary in the aftermath of a natural disaster, some individuals and businesses may use this opportunity to prey on those in need. Before having repairs made to your damaged home, gather the best information you need to protect yourself. Before allowing anyone to repair your home, verify his or her credentials. Check with the Nebraska Department of Labor to find whether your contractor is properly registered and insured. You can check their website above, or call 402-471-2239. Never sign any document or pay any contractor before verifying license and registration. Get three written estimates, make sure each contractor bids on exactly the same work. Talk with neighbors about who they are using and what they are being charged. Negotiate a reasonable down payment, and only pay in full when the work is done to your satisfaction. Pay by check or credit card and keep all receipts. Write down the contractor’s vehicle information (make, model and license plate) even drivers license number, if possible. Know your cancellation rights. You have the right to cancel within three days if you signed it at your home or at a contractor’s temporary location, like a convention center or restaurant. Those who suspect a home improvement scam should contact the Attorney General’s Consumer Protection Divisionat https://protectthegoodlife.nebraska.gov or 800-727-6432. 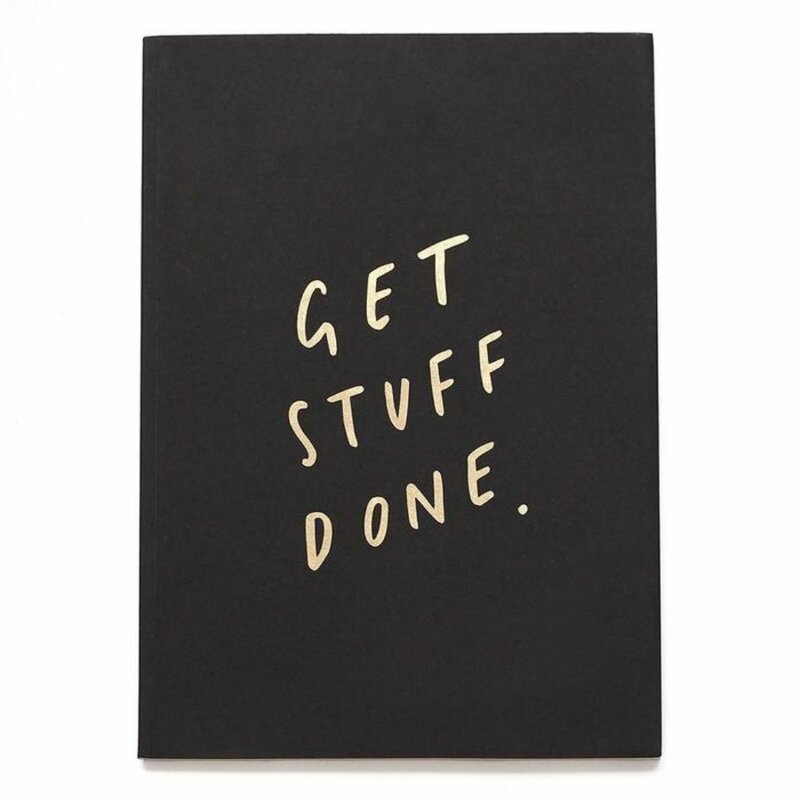 As we get closer to the final third of the legislative session, I’m already beginning to work on what topics and what bills I want to bring next session. If there is something you feel we can, and should work on, please don’t hesitate to contact my office and talk to us about it. I always like to get an early start so we have plenty of time to research and perfect, the bills we bring forward. Now is the time to get started on the next session, please don’t wait until October or November to give your input. Seize the moment! It’s that time of year again when there are all kinds of boards and commissions in the state that are looking for dedicated citizens to serve. These positions are appointed by the governor and range in topics from Juvenile Justice to Geology. If this sounds like something you might be interested in, please visit the Governor’s website here. You will be able to find a listing of every board that has an opening, as well as a brief synopsis of what is involved. You can also find an application here. Our state is a better place to live and raise our families when our citizens step up and get involved. For hard copies of these documents, please call my office at 402-471-2627 and we will be happy to place one in the mail to your home address. What a week in the Legislature, what a week in Nebraska. As we wind our way to the end of public comment committee hearings, we see more clearly the path that lies ahead for the remainder of Session 2019 with the announcement of Senator, Committee and Speaker Priority Bills. 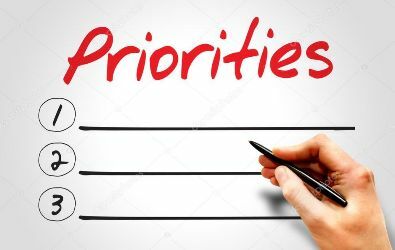 Priority Bills are given priority status and generally considered ahead of other bills for debate. Each senator selects one priority bill, a committee gets two, and the Speaker may select up to 25 priority bills. For my Priority Bill, I have selected LB138 Provide for additional Military Honor Plates and Support our Troops Plates, as well as creating a specific fund that is designed to increase our efforts to recruit a highly skilled workforce to stay in Nebraska upon their retirement from the Military. Two of my bills have been designated Speaker Priorities, those are: LB6 and LB15. LB6 – Changes residency provisions relating to persons on active duty and their dependents for college tuition purposes and will allow dependents of an active duty member of the military, who is assigned to duty out-of-state, but has been accepted to a college or university in Nebraska, to receive in-state tuition. This is important to our state and to the students who need an uninterrupted education process. 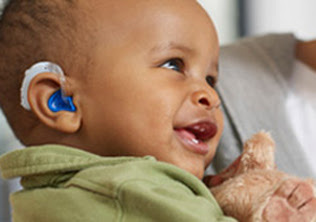 The second, LB15 will provide health insurance coverage to children in need of hearing aids. I am thrilled that Speaker Scheer has chosen this as one of his Priorities, and grateful to have the support of so many of my fellow Senators in the way of co-sponsorship. Nebraska children are our future and we need to give them every chance at success. 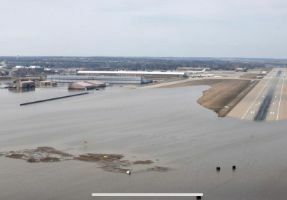 Not news to Nebraskans is the record flooding our state has seen this past week, including Offutt Air Force Base. If flood waters rise around your vehicle, abandon and move to higher ground. As recovery begins, knowing where to turn for information can be overwhelming. The Nebraska Emergency Management Agency (NEMA) website is continually updating information. You can access that information here. For information on debris clean-up, contact the Crisis Cleanup Hotline at (402) 556-2476. Farmers who have lost machinery or livestock should report to the Farm Services Agency office. County office contact information can be found on the the agency’s website here. It’s not just a hashtag, it’s a way of life. Nebraskans and people though out the country are offering assistance. All donations – monetary, goods and services, volunteers – are being coordinated through Nebraska 211. To access Nebraska 211 within Nebraska, Dial 211. Outside of Nebraska, call (866) 813-1731. As individuals and communities respond to this emergency and begin the possible long road to recovery, it is very important to be aware of many common legal issues that may arise during or after a disaster. Legal Aid of Nebraska’s Disaster Relief Project offers free legal assistance to victims of state-declared disasters, through a network of volunteer lawyers across Nebraska. Victims may get free legal information on these issues at our website here. This past week I introduced a Legislative Resolution 39 to recognize Madison DeMeo for her generosity to our community. The Nebraska Legislature and I are very proud of Bellevue’s very own, Madi. 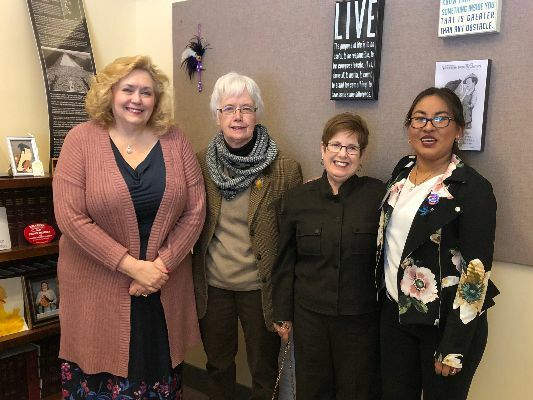 Thank you to the 48 other Nebraska State Senators who enthusiastically supported LR46 to celebrate Women in Public Office Day which took place on March 19th. 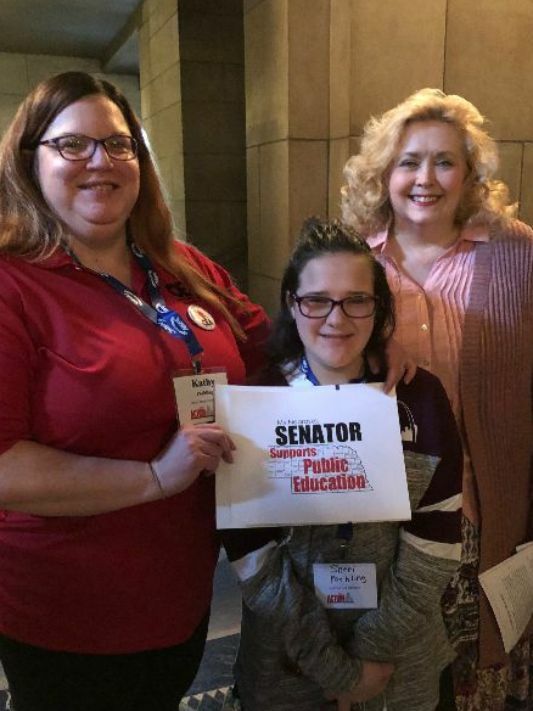 I had the pleasure of meeting with constituent supporters of public education as they visited the Capitol on Omaha Education Association (OEA) Action Day. We support all students and teachers! The Governor has signed LB12, LB115,LB7, LB11 and LB8 into law. That means the only bills we have left that are waiting in the General File queue are LB6, LB9, LB13, LB15, LB138, LB137 and LB594. We are having a productive session and I am hopeful that we will continue to move items through in a timely manner. If this sounds like something you might be interested in, please visit to the Governor’s website here. You will be able to find a listing of every board that has an opening, as well as a brief synopsis of what is involved. You can also find an application here. Our state is a better place to live and raise our families when our citizens step up and get involved. Oliver VanDervoort-Legislative AideWe are here to serve the residents of District 3 and we are happy to respond to any questions or concerns you may have. The start of this week was busier than most as we had the final two committee hearings for my bills. 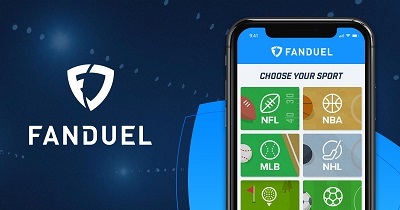 LB137, otherwise known as the Fantasy Sports Contest Act will make companies like FanDuel and DraftKings have to register and pay a registration fee in order to operate in Nebraska. These companies are already here and already doing business in the state. My bill would make sure we’re not the “wild west” of Fantasy Sports and we have some way to regulate and get a little revenue from these types of companies while making sure no one is behaving unscrupulously. Earlier in the day, LB15 went in front of the Banking and Insurance committee. 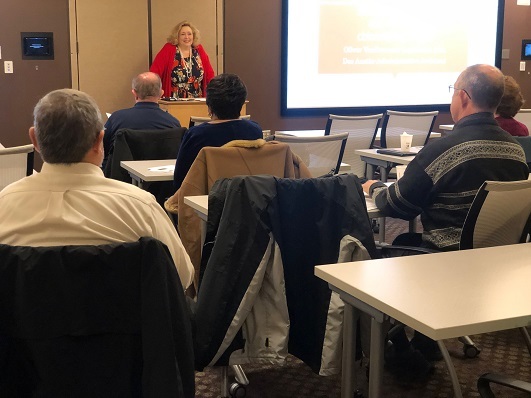 Otherwise known as the Children of Nebraska Hearing Aid Act, this would make it easier for parents to provide their children with hearing aids by making it a requirement for health insurance companies to cover them in certain circumstances. I believe this is incredibly important for the children of the state of Nebraska. 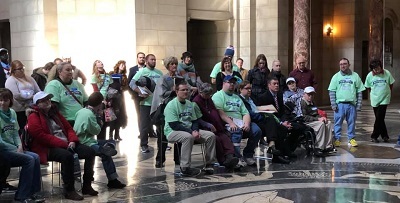 Prior to the hearing for LB15 a Press Conference was held to announce the bill and to hear from sponsoring Senators, families affected by hearing loss, and speech and hearing professionals in support of the bill. Sponsor Senators present from L-R: Senator Matt Hansen, Lincoln, Senator John McCollister, Omaha, Senator Blood, Senator Megan Hunt (front) and Senator Sue Crawford, Bellevue. For the second year in a row, high school student Bailey Mooney of Bee, Nebraska, came to the Legislature to spend the day shadowing myself and staff. Bailey is a senior at Seward High School where she participates in Debate, and enjoys all things Nebraska Legislature. In the photo below, Bailey is showing off her photo featured in last week’s Unicameral Update announcing the dates for this year’s Unicameral Youth Legislature. 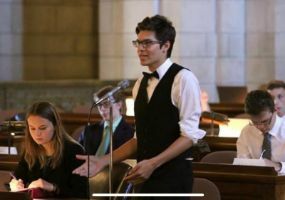 The Youth Legislature, in which Bailey is an Alum, is a summer program where student senators learn the inner-workings of the Legislature through simulation. I predict that someday the Unicameral will include a Senator Bailey Mooney. As far as bills that have already been heard and are winding their way towards passage, LB11, LB7, LB12, and LB115 were all passed on final reading over the last week and were sent to the governor. He has signed LB12 and I expect the other three will be the law of the land soon enough! LB8, my medical director flashing lights will be joining the quartet quickly. It was placed on final reading on Wednesday and will hopefully get a final vote next week. LB9, my Digital Ledger Technology bill was voted out of committee earlier this week as well. It’s now on General File and I look forward to the debate in front of the full legislature. Advocating on behalf of family and friends in need of necessary mental health care, and for those who are caregivers, our guests shared their stories and spoke of their support for legislation to help ease the burdens faced by those in need of assistance. On a lighter note, it’s always a pleasure to meet visiting dignitaries when they visit the legislature. 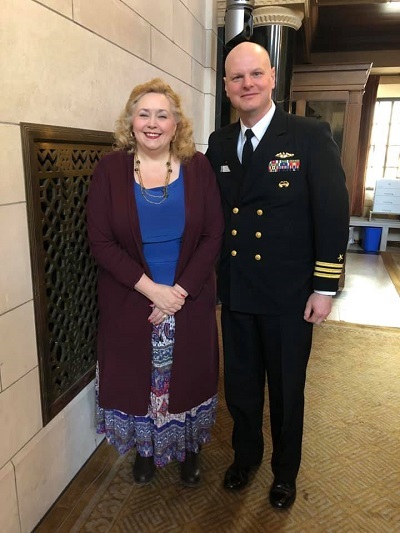 I was honored to be able to meet and talk briefly with Commander Alex Baerg of the USS Nebraska. Commander Baerg was joined one his visit by his wife, Nicole. It was also an honor to take in the “Birthday Our Way” celebration last week. This is a celebration of birthdays of people with developmental disabilities put on by the Nebraska Association of Service Providers. 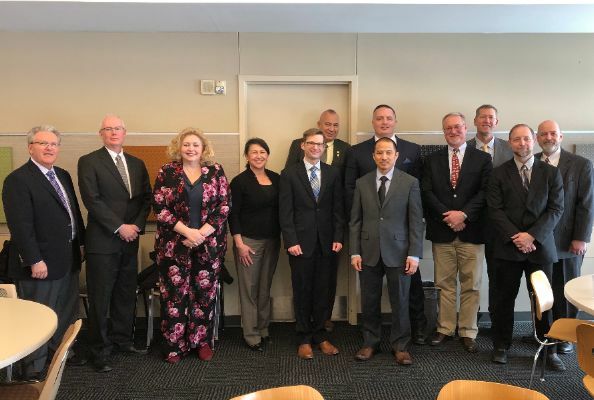 The USSTRATCOM Strategic Leadership Fellows Program is a graduate-level leadership development program for civilian employees of the military and is based at the University of Nebraska Omaha’s College of Business Administration. 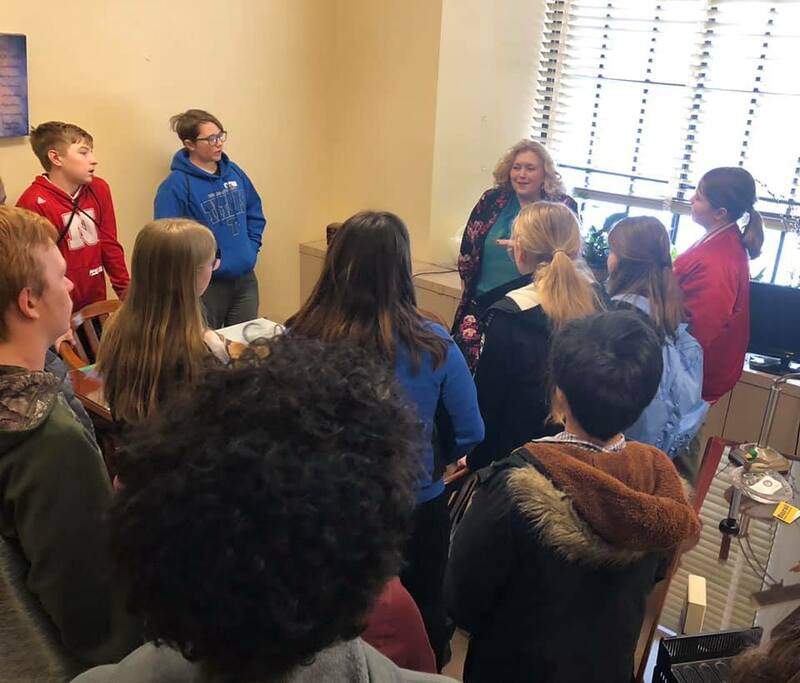 Following lunch at Selleck Dining Hall on the campus of UNL, the Senators in attendance shared information and answered questions regarding their respective districts, the legislative process and current legislation being considered. Attending from the Legislature: myself, Speaker Jim Scheer of District 19 and Senator Tom Brewer of District 43. My bills have now all had their committee hearings and focus will move to getting them passed on the floor. However, hearings for various other bills will be going on for a few more weeks. If there are any bills you see that are scheduled for a hearing in any committee, always remember you have a say in what decisions the committee may make and how legislature may vote on the bill. If this sounds like something you might be interested in, please visit to the Governor’s website here. You will be able to find a listing of every board that has an opening, as well as a brief synopsis of what is involved. You can also find an application here. Our state is a better place to live and raise our families when our citizens step up Save & Closeand get involved. The final push begins for the bills I’ve introduced this year. Next Monday the hearing for my final two bills takes place. Last week, we also had two committee hearings starting with my Meat Labeling bill, LB 594 in front of the Agriculture Committee. 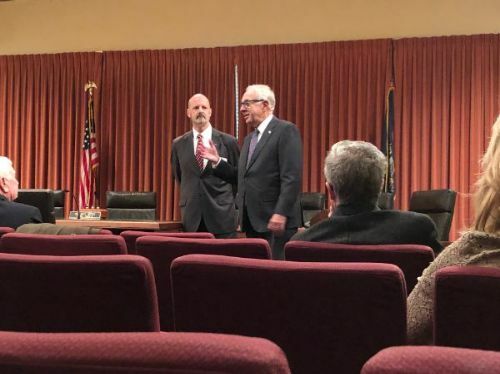 This bill is all about truth in food advertising that refines Nebraska’s complaint-driven system for people who see something like a package of “BBQ shreds” that don’t have any meat in them who feel as though the labeling is misleading or confusing. The original draft of the bill embraced only meat products. After meeting with the Attorney General’s office, we decided to bring an amendment that broadens the scope to all food packaging. We also removed the USDA definition of meat in the bill since it is already defined at the federal level. By doing this, I believe it will serve the consumers of this state without being too restrictive. As long as a company isn’t intentionally misleading consumers, they’ll never run afoul of this bill, should it eventually become law. At the end of last week, a bill you may remember from our last session, LB9 was presented to the Government committee. Should it become law it would prohibit cities, counties, and villages from taxing or regulating distributed ledger technology. This is a technology that is usually associated with cryptocurrency but is used in a variety of transactions including banking, agriculture, insurance and real estate. My bill avoids potential piecemeal ordinances on the technology. It also sends a clear message that Nebraska is a place where companies that use DLT can feel comfortable doing business without unnecessary hurdles. There was no opposition to the bill and I expect it to get out of committee soon. Next Monday, LB15 will go in front of the Banking and Insurance committee. 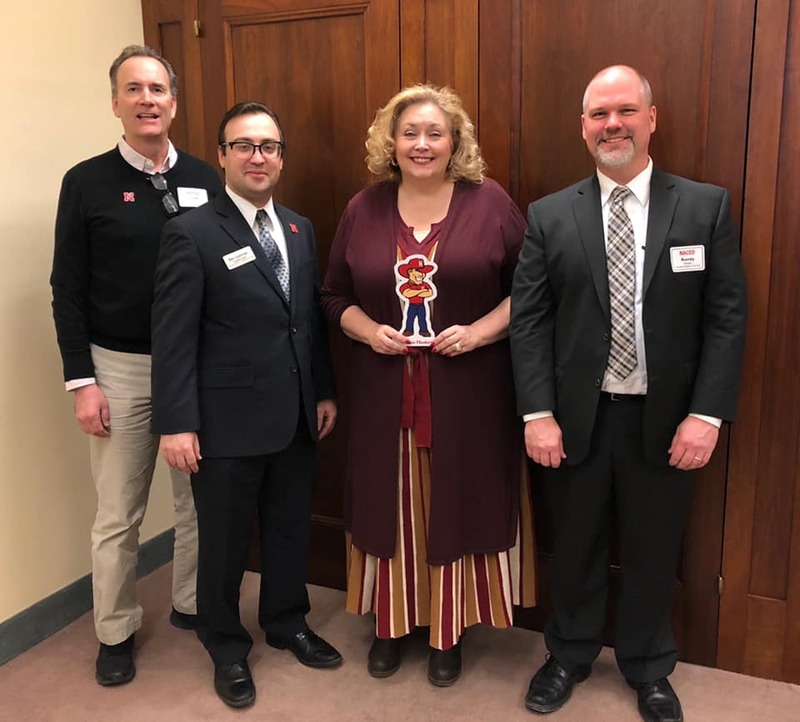 The bill referred to as the Children of Nebraska Hearing Aid Act , would make it easier for parents to provide their children with hearing aids when needed by making it a requirement for health insurance companies to cover them in certain circumstances. 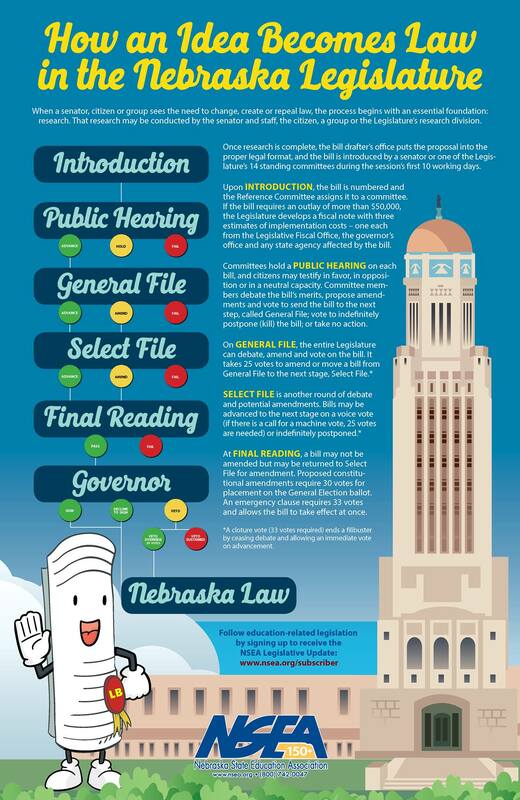 I believe this is incredibly important for the children of the state of Nebraska. 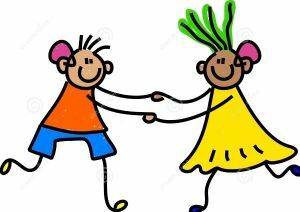 Hearing plays an important role in a child’s language development and learning. 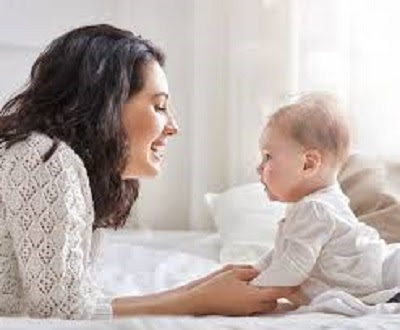 Early intervention is key to that child’s success. While I expect these bills to get out of committee with very little problem, there are other bills that have already had their hearing and are headed towards passage and becoming a law. LB11, my interlocal agreement for nuisances bill was officially placed on Final Reading late last week. That means it needs just one more vote before it goes to the governor’s desk for his signature. LB115, my advanced enrollment for military dependents has also been placed on Final Reading. It’s my hope both will go through this final step at some point this week. I was also happy to see LB13 advance out of the Revenue Committee so we can debate the bill on the floor. This bill will make sure that any woman who is in the process of breastfeeding their child, will be exempt from indecent exposure laws in Nebraska. While we already have breastfeeding laws in place, they do not specifically exempt women from indecent exposure. This bill would make sure breastfeeding mothers in Nebraska are completely protected and need not worry about who they offend while providing nutrition their child. My bills will have all had hearings right around this time next week; however, hearings will be going on for a few more weeks. If there are any bills you see that are scheduled for a hearing in any committee, always remember you have a say in what decisions the committee may make and how legislature may vote on the bill. If you follow my page “Senator Carol Blood” on Facebook, I do try to provide links to the hearings so you can watch them live on your computer or smart phone. If you have questions or concerns, please be sure to reach out to any of our District 3 Team Members. It was another busy and productive week, despite the fact that it was the first week since hearings started that we didn’t have a bill go through committee. We’ll change that this week, with my Meat Labeling bill, LB 594 in front of the Agriculture Committee Tuesday afternoon. 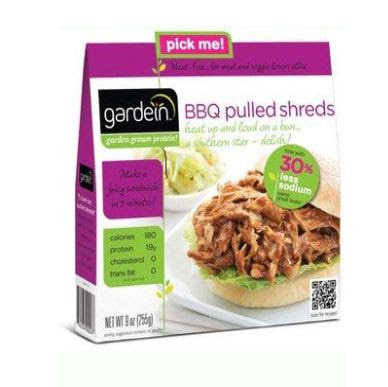 This is a bill that aims to bring truth in food advertising and set up a complaint-driven system for people who see something like a package of “BBQ shreds” that don’t have any meat in them who feel as though the labeling is misleading or confusing. Under LB594, someone who feels as though a company is intentionally misleading people into thinking vegetarian offerings are in fact meat could contact authorities who would investigate the issue using the Deceptive Trade Practices Act as well as the Pure Food Act and decide whether prosecution or civil action can be taken. I feel in the long run, this will lead to more honest advertising and marketing by companies that are jumping into the meat-replacement market. This will also protect ag producers in our state who already follow specific guidelines when it comes to labeling and marketing. Many of our livestock producers may be losing out because of these misleading products being sold to those who are looking to buy beef, chicken or pork products. While it has gone through some changes since it was first introduced, including an amendment I am presenting at the hearing, we believe it will do what we’ve always wanted it to do in regards to protecting the industries that are the lifeblood of this state. A bill that is a repeat from last year, LB9 will go in front of the Government committee this Thursday, February 21. This will prohibit cities, counties, and villages from taxing or regulating distributed ledger technology . This is a technology that is usually associated with Bitcoin but is used in a variety of transactions including banking and real estate. In many ways, these kinds of transactions and the contract that can be created using digital ledger technology are more secure than offline contracts and certainly more efficient. My bill avoids potential piecemeal ordinances on the technology. It also sends a clear message that Nebraska is a place where companies that use DLT can feel comfortable doing business without unnecessary hurdles. In honor of the 210th anniversary of the birth of Abraham Lincoln, on February 12, 1809, the 106th Legislature began today’s session with a Presentation of Colors ceremony after the Morning Prayer. 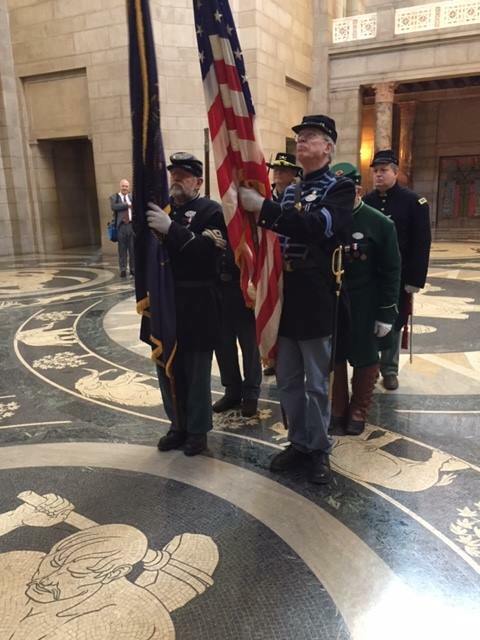 The colors were posted by the Nebraska Department of the Sons of Union Veterans of the Civil War. After the Civil War, the Grand Army of the Republic (GAR) was formed as the first-ever fraternal organization for veterans. In 1881 the Grand Army of the Republic created the Sons of Union Veterans to carry on the memory and traditions of the G.A.R. after the last G.A.R. members were gone. Today, the Sons of Union Veterans are recognized by Congress as a Veteran’s organization, charged with keeping alive the memory of those who served our country during the Civil War, 1861 to 1865. 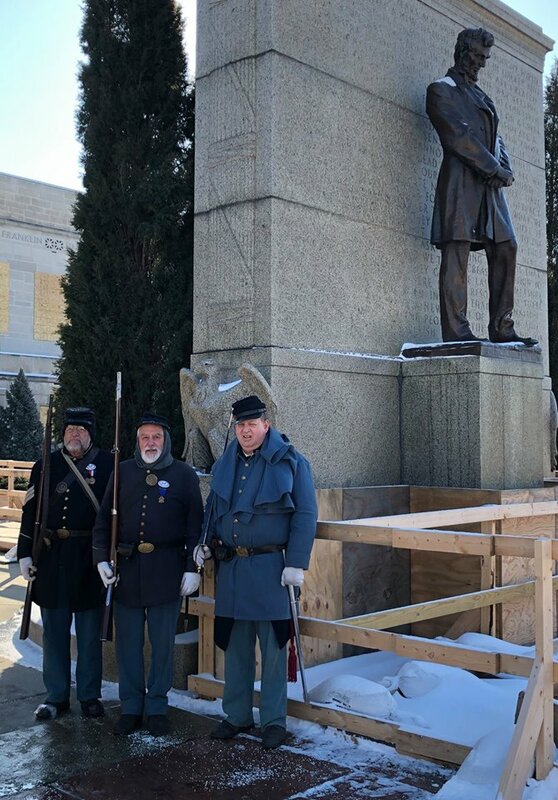 In addition to their Presentation of Colors, the Sons of Union Veterans had an honor guard posted at the Lincoln Statue at the west entrance. As you can see, freezing cold temperatures and icy walkways wouldn’t stop these men from doing their duty on this important day. I was visited by the Papillion La Vista High Ability Learners program last week as well. We discussed how the Legislature works, how legislation is crafted, things they can do now to prepare themselves to be great leaders in the future and chatted on a long list of legislation. I was impressed by the questions they asked and how they think about the issues the state and the country are facing. While Abraham Lincoln might have turned over 200 last week, we are also celebrating the 150th birthday of the University of Nebraska. 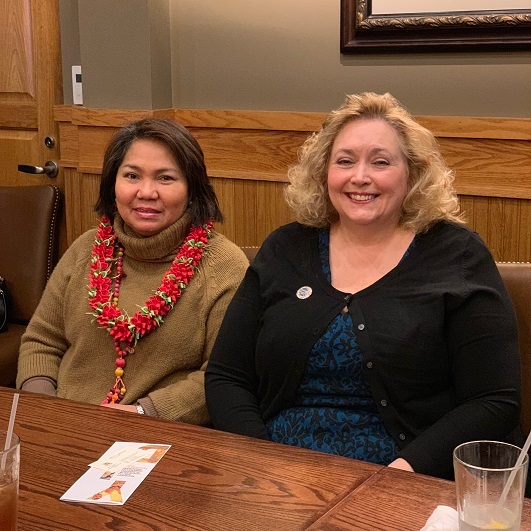 As part of our ongoing efforts to recognize how important the University is to the state, I chatted with representatives of the Douglas/Sarpy County Extension Program about the many programs they offer for both rural and urban residents. 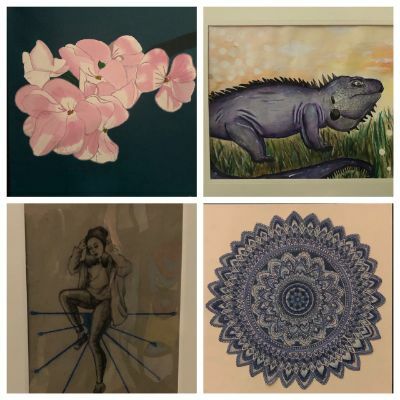 It has been another productive week for District 3. Three bills received hearings last week, we’ve now had 13 of my 17 total bills heard in their respective committees. It is our hope that they will be voted out for full debate. Last Tuesday, LB138 was presented to the Transportation and Telecommunications committee. This is a bill that would create license plates to honor veterans of the Iraq, Afghanistan, the Persian Gulf war, War on Terrorism or the Vietnam war. This bill would also create a “Support Our Troops” plate that anyone can purchase. Funds from the “Support Our Troops” plate will be used to amp up our efforts to recruit soon to be separated or retiring veterans to stay and enter Nebraska’s job market. We must work harder to keep this highly qualified demographic in our state. The bill didn’t have any opposition and I expect it to get to the legislature floor for full debate. On Wednesday, we had the hearing for LR2. 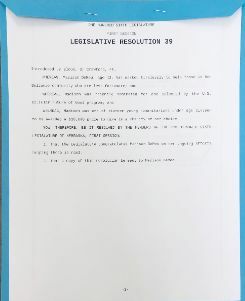 This is a Legislative Resolution that would rescind any resolutions that call for a constitutional convention that were passed over a period of decades here in Nebraska. One was passed before the turn of the 20th century in 1893. In total, there were eleven old resolutions outstanding, causing confusion as well as very real legal hurdles. Many experts have explained the pressing need to rescind all of these ancient, outstanding Article V resolutions in order to remove any confusion and to start fresh. By cleaning the slate LR2 would do exactly that and any new efforts for an Article V convention will not be butting heads with old, out of date resolutions. 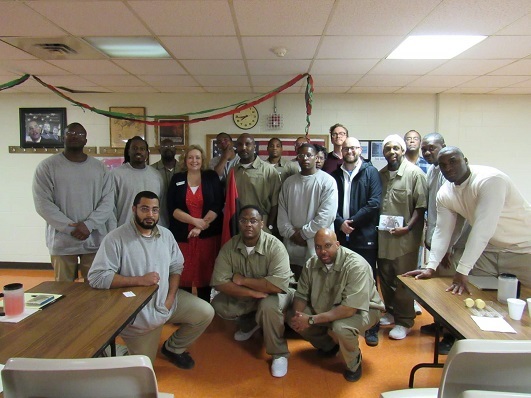 works to make sure that the Department of Corrections is carrying out its own policies to the letter of the law. A small part of our overcrowding issue can be better addressed by simply adhering to the existing rules that are designed to move the inmate(s) through the system smoothly as they work to rehabilitate themselves to re-enter society. Among those that have been voted out of committee, LB 12 my military spouse realtor’s bill is on final reading and almost ready for the Governor’s signature. LB 7 The Counterfeit Airbag Protection Act just passed through the first round of voting, without a single “no” vote at the end of last week. A bill on advanced enrollment for children of active duty military members and a tool for Inter-local Agreements have passed through General File. Both are set for Select File early this week. I expect more of my bills to get voted out of committee this week while I prepare to present my last four bills in upcoming hearings. Those hearings include my meat labeling bill, LB594 which seeks to make sure that insect-based, plant-based or lab-grown products are not billing themselves as meat products. It is a consumer-driven bill that protects Nebraska’s number one industry. That bill will be heard in front of the Agriculture committee on Tuesday, February 19. Next Friday, February 22nd LB9, my Digital Ledger Technology bill will be heard in the Government committee. If you are interested in testifying at the hearing for either of these bills or want to send a letter of support, please don’t hesitate to contact my office. The home stretch of the legislative session means some very long nights and some very tense moments on the floor of the legislature. As you know, we have been debating the state budget this week and there are some things in the budget that have gotten more attention than others, but it’s important to note that before this session is over, we will have a budget agreement. I’ve heard from some who are worried that we would adjourn without the budget being passed and I just want everyone to know that can’t and won’t happen. On a personal note, my priority bill, LB 685 advanced through Select file and enrollment and review and is soon to be placed on Final Reading. Considering the bill hasn’t gotten a “no” vote at any stage, it appears it’s on track for the Governor’s desk and then will hopefully become law. LB685 provides a funding priority for special-needs military dependents under the Developmental Disabilities Services Act. This would specifically add dependents of active duty military members who are severely developmentally disabled to the list of treatment priorities kept by the DHHS. In essence, this would allow prioritized treatment for those who need it most but are not covered by Tricare. We were very careful to make sure this isn’t coming at the detriment of others who also need services. One of my other bills, LB735 is part of the Urban Affair’s Committee priority bill, LB873. My part of the bill would provide for interlocal agreements regarding nuisances. Currently, municipalities have the authority to regulate and enforce nuisances within their borders. 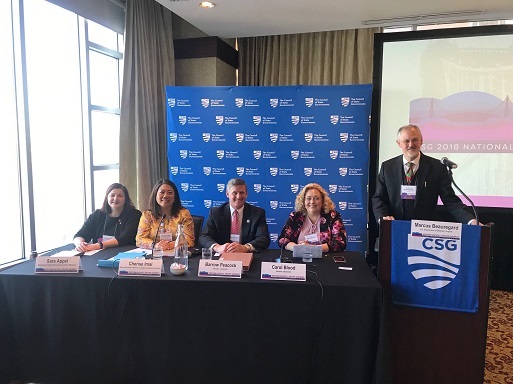 This would build on this legislative authority by allowing municipalities to enter interlocal agreements with a county to provide for cooperative action to remove or prevent nuisances. Interlocal agreements have always been a great way to save manpower and funds here in Sarpy County. We had a good debate on LB873 and it appears that my little section of that bill is something that is acceptable to the body as a whole. Because LB873 has so many moving parts, there will be another day of debate before it moves onto the next round. 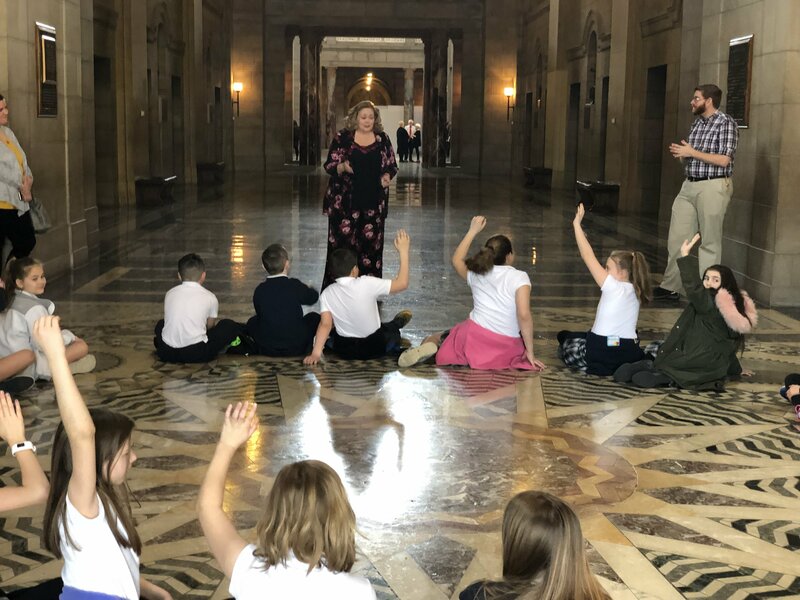 Off the legislature floor I wanted to make sure and point out that the children are our future especially when it comes to the Nebraska legislature. This is why I so love the work that is put in every year when it comes to the Youth Legislature. This is a program that is open to all Nebraska high school students and allows them to walk in the footsteps of a state legislator for a day. They will sit on a committee, hold a hearing on bills and then take up floor debate in the same chamber where we do the state’s business. It’s a great experience for kids who have a real interest in government. 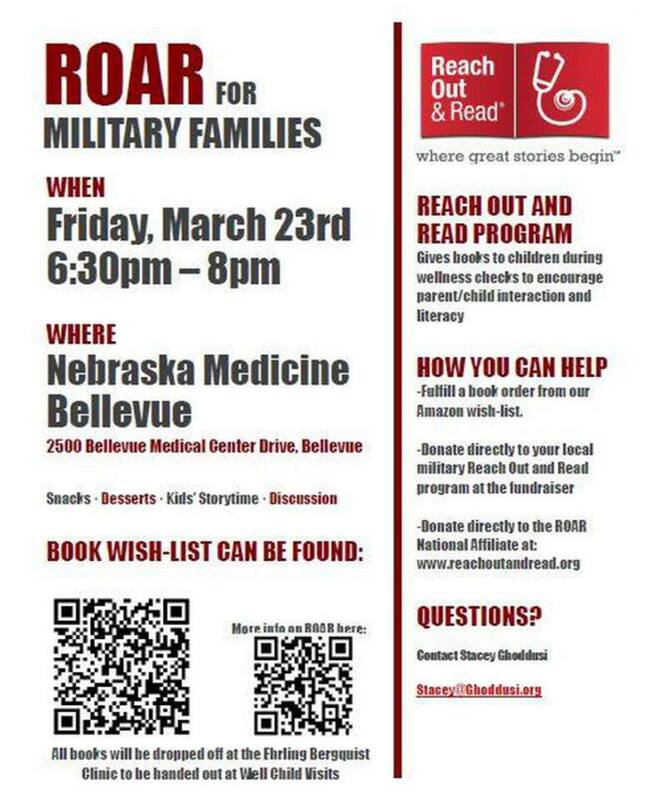 Senator Sue Crawford and I will both be reading at this event for military families Friday night. The ROAR program gives books to children during wellness checks to encourage parent/child interaction and literacy. Please share this message with your military friends in our area who have children. Donations of new books are also accepted if you would like to contribute. If you don’t have any plans tonight, you should stop by. Monday is officially the 49th day of the legislative session meaning there are just 11 days left on the legislative calendar. Time is running out to make your voice heard on issues that are important to you. If you have any questions or comments about my bills or any legislation in front of the legislature, please don’t hesitate to email or call my office at cblood@leg.ne.gov or 402-471-2627. Some of these links have documents that can be printed. If you would like a hard copy of one or more of these documents, please call my office at 402-471-2627 and we will be happy to place it in the mail to your home address.